Wednesday, July 11, 1888 One of warmest, & as pleasant. About as usual with our folks, & spending day much same tho' is Ellery's 38th birthday, had strawberries still, & Mr & Mrs Wedgewood took supper with us. Mrs Waterman at Mrs Braytons again. Rather better self, tho' realize considerable nervousness, but passing tho' "regular routine" much as usual, or perhaps with more reading in Grey Mannering. Celia Spaulding in awhile eve. 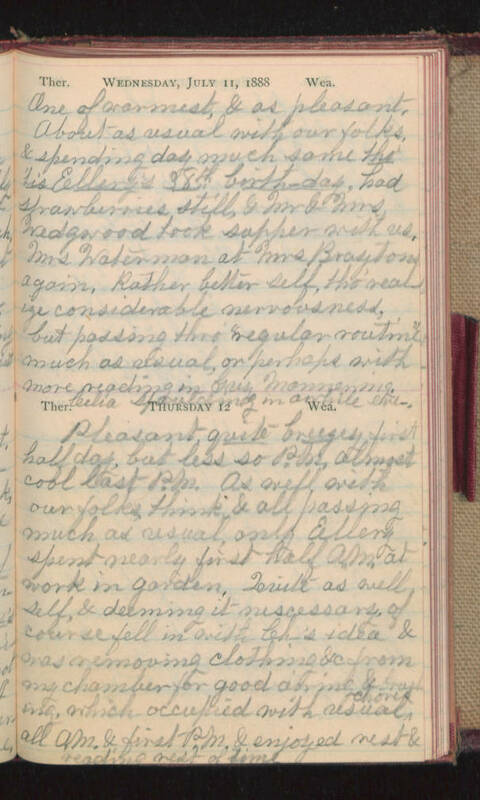 Thursday 12 Pleasant, quite breezey first half day, but less so P.M. almost cool last P.M. As well with our folks, think & all passing much as usual only Ellery spent nearly first half A.M. at work in garden. Quite as well self, & deeming it necessary, of course fell in with Ch-'s idea & was removing clothing &c from my chamber for good airing & brushing, which occupied with usual chores all A.M. & first P.M. & enjoyed rest & reading rest of time.